The dowry system also known as dahej pratha is a great curse on our society. The dowry practice has been continued since long and still more common now-a-days. We live in the digital era, where science, technology and industry have made rapid advancement and mankind, and we claims to be more civilized, dowry regrettably has become integral part of marriage. The only root cause of female infanticide and female foeticide is dowry that ultimately leads to many other social issues. It is quite seen that the marriage based on dowry practices is unhappy marriage. We have seen the instance of dowry deaths on news channels are on the rise in spite the anti-dowry laws by the government of India. Many social reformers and great thinkers put their whole life for the right of women; many laws have been made to eradicate this evil practice, but in vain. Girls should become financially independent to make dowry redundant. The youth should come forward; to educate people and create awareness is the only way to curb this evil practice. 1. 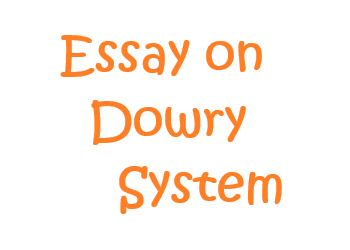 The dowry system has lowered the status of women. 2. The dowry practice is prevalent since time memorial. 3. Some parents auction their son for marriage. 4. Cash and things of everyday use are demanded in dowry. 5. The bride who brings insufficient dowry is made to suffer. 6. We have become the object of ridicule in the eyes of other nation. 7. A number of girls in India remained unmarried due to the practice of dowry. 8. Several women organizations have come up to check this problem. 9. Awareness and education could help curb this evil practice. 10. Man and woman are the two wheels of life. Dowry system has become the touchstone of every family. It is a contagious disease and no family is untouched from this curse. The system has been prevalent in India since time memorial. Our newspaper columns daily give details of dowry deaths or dowry menace in one way or the other. Though many great thinkers and reformers like Swami Dayanand Sarawati, Mahatma Gandhi & several others have tried to eradicate this social evil but they have met with the little success. Over the years, the custom of dowry practice gradually increases. Now-a-days it becomes a fashion or more common, dowry is expected and demanded. There are many parents who auction their son for marriage. There is a fixed price tag for individual according to their professional and educational status (such as I.A.S, I.P.S, Doctors & Engineers) in many states in India. The birth of female child is considered to be a bad omen in the family. They think that men are superior to women in all respects. The system has plagued the society and it has brought indelible slur on the name of the Indians. The poor do not find suitable matches for the girl for the want of money. The parents of the groom side present innumerable demands such as cash, ornaments, furniture, electronic items, motor bike, car etc. ; that work as a hammer in the poor. The result is that the girls remain unmarried and that unmarried girl becomes a headache to the parents. Even some parents who are capable, they sell off their property to get their daughters married. In the many cases when the girl does not bring sufficient dowry from her parents, quarrel arises. The mother-in-law passes filthy remarks on them. Sometimes the girls are beaten to death or the girl themselves commit suicide after being harnessed by their in-laws. In other cases the girls are either divorced or burnt alive. When we hear such news, tears roll down our cheeks and our head hang in shame. Just thinks of hundreds and thousands of such girls who have to suffer for no fault of theirs. Dowry is eating away the society. It is spreading like a cancer. We have seen many such cases of dowry in news channels where the girl burnt alive by their in-laws only for the sake of dowry. It’s time to wake-up, we need to punish such cruel people and hanged them publically so that the others may not dare to raise their head. This is big challenge to the modern youth and only they can uproot this evil. Though government has passed anti-dowry laws but without the help of the society nothing can be done. The youth should be strict enough not to accept the dowry. They should take a pledge to abolish it. Only a war footing campaign can uproot this social evil. The question is how to eradicate the dowry practice? The solution to this major issue of dowry system is to create awareness and educate people about the negative effects of dowry. Youth young boys and girls should not come under the pressure of parents. Educational institute and women organisation should canvass against the dowry system. Tough measures should be taken by the government; stringent laws should be strictly enforced to check this evil practice. The young women should come forward and take initiative to refuge categorically to the proposal who demands dowry. The girl should strong enough and make herself financially independent; they should never feel weak and helpless. Inter cast marriage should be encouraged. The prospective grooms too should come forward and actively participate in bringing about the social change in our society. The print and electronic media should contribute to make people aware about the dowry consequences because they are the pillar of the society and make a big impact on people’s mind.